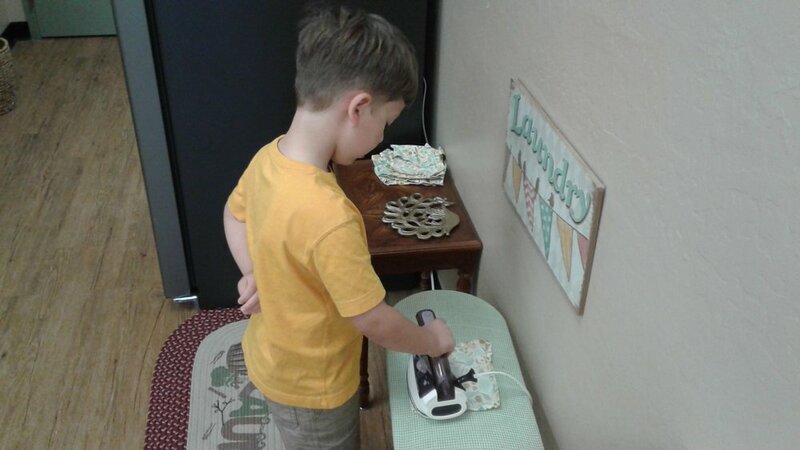 At first glance, these seem to be mundane chores that adults do for a utilitarian purpose, to the child, it is a chance to learn, practice order, concentration, independence, and mastery of a task. Through repetition of these activities at home, the child grows in self-confidence while contributing to the family and taking a more active role in the care of his/her environment. 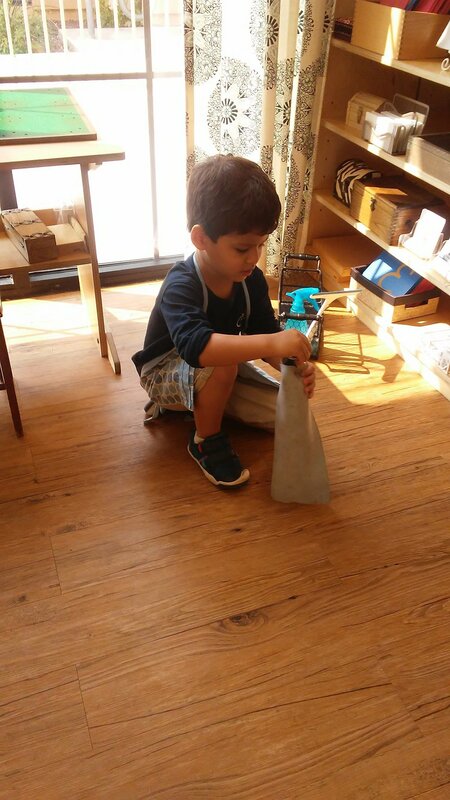 With the proper tools (child-size and easily accessible), the child can help sweep, mop, help with the laundry, folding, cleaning the table, watering the plants, and placing dishes in the dishwasher after meal time. Children thrive in being able to dress themselves, tie their shoes, button their shirts or coats, comb their hair or brush their teeth. 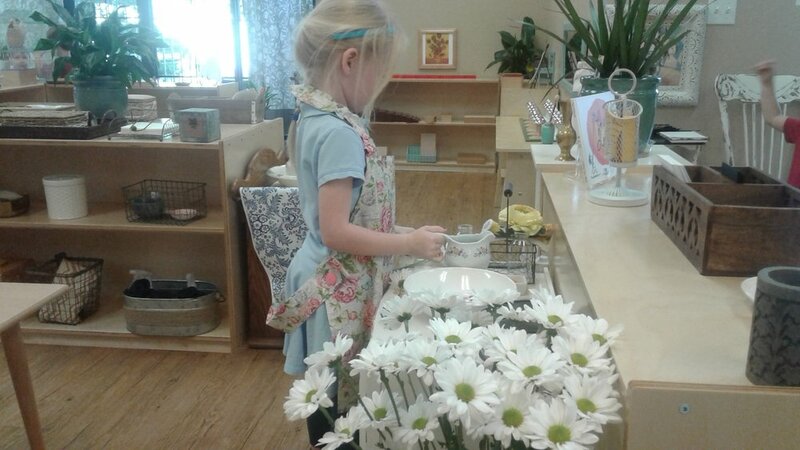 Children love helping their parents prepare food. Peeling, cutting, chopping, washing vegetables; stirring, mixing, and following a recipe; and under close supervision of an adult, cooking and baking. The few important things to remember is to allow your child the opportunity to fail; allow plenty of time for your child to work at his/her own pace; if your child shows signs of frustration, gently ask if you can help without correcting the error; stand back and observe your child and you will notice the beauty of the making of an adult. 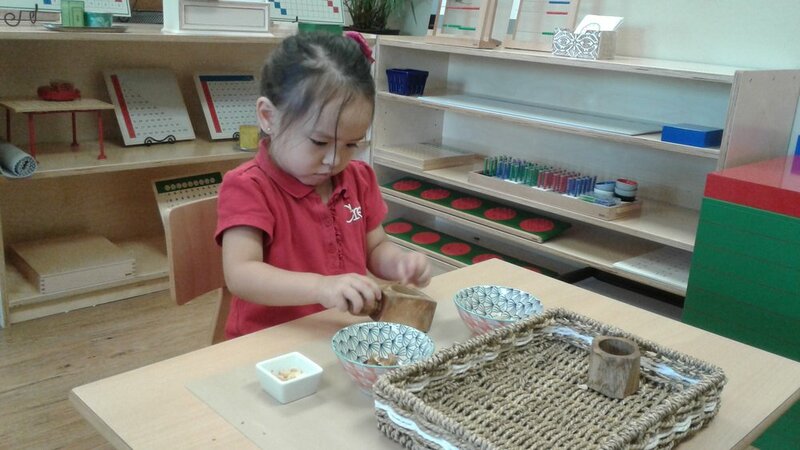 There are many resources available to the parent that explains Dr. Montessori's philosophy. Here are a few suggestions: Maria Montessori Speaks to Parents (available through AMIUSA bookstore https://amiusa.org/products-page/books/); The Child in the Family (AMIUSA bookstore). Both these books are available in Spanish. Books to read with your children: Tidy Up! 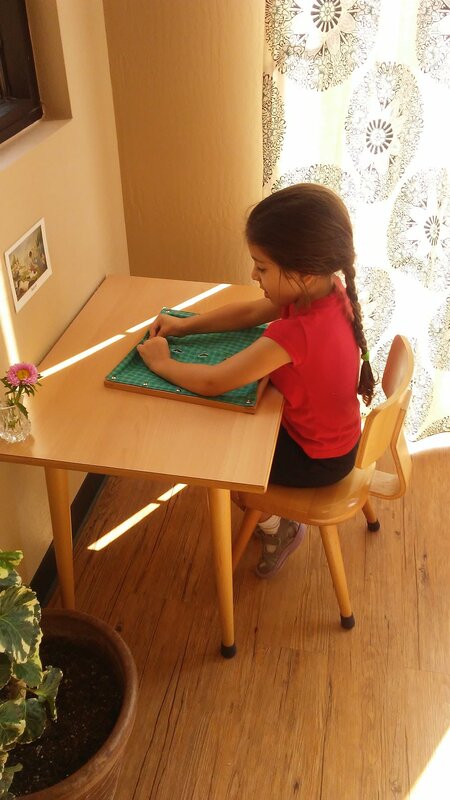 (Montessori Services http://www.montessoriservices.com/books-resources/montessori-at-home). Sewing a button or a tear can be implemented at home. Preparing a snack in school or home builds self-confidence and independence. Combining Language and Art: Reinforcing the spelling of puzzle words in a fun way. This child is participating in care of the environment. 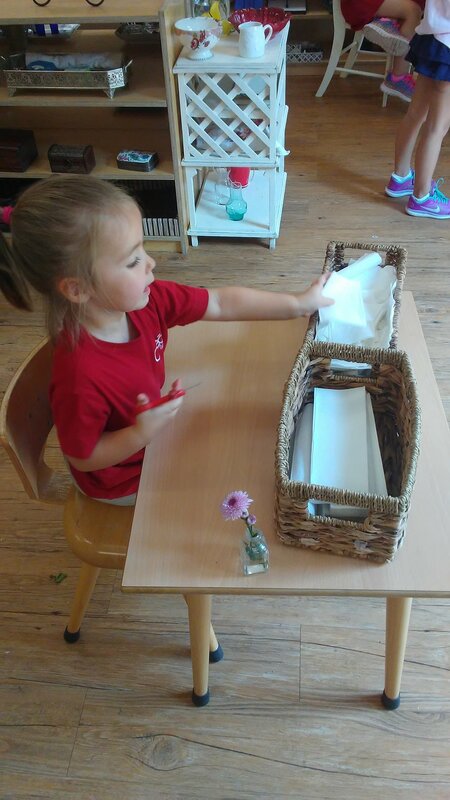 Folding paper towels at school gives the child the skills to fold bath towels or clothing at home. Caring for the birds is a great responsibility at school or home. 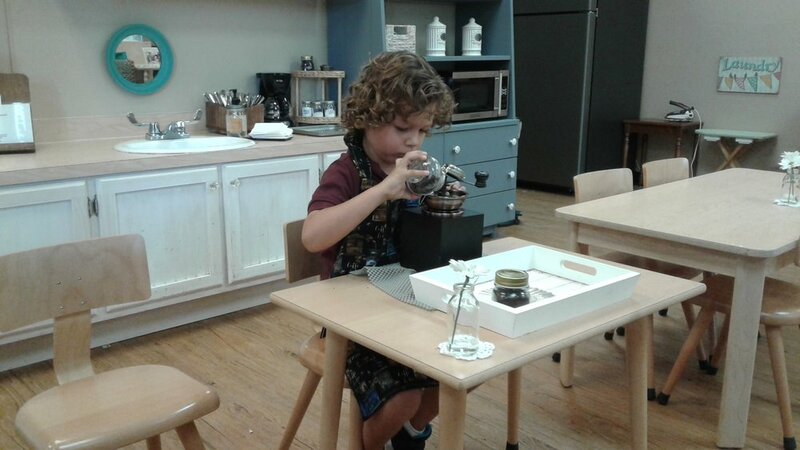 Here a child is practicing with the dressing frames. A child can learn how to zipper, button, buckle, and tie a bow. Beautifying the environment through arranging flowers in a special vase. Juicing helps with fine and gross motors skills as well as, something refreshing to drink. This is a simple, yet beneficial exercise that can be done at home. Careful purposeful hand washing encourages good grooming. Care of the environment. This child is helping to keep our garden beautiful by watering. Learning to cut carrots for snack allows the child to work on fine motor skills, independence and contributing to the class. Children love to help their friends make snack. It is clear to see the results of your hard work when washing a window. It also encourages fine and gross motor skill practice. As September starts to wind down, we look forward to another month of great work. 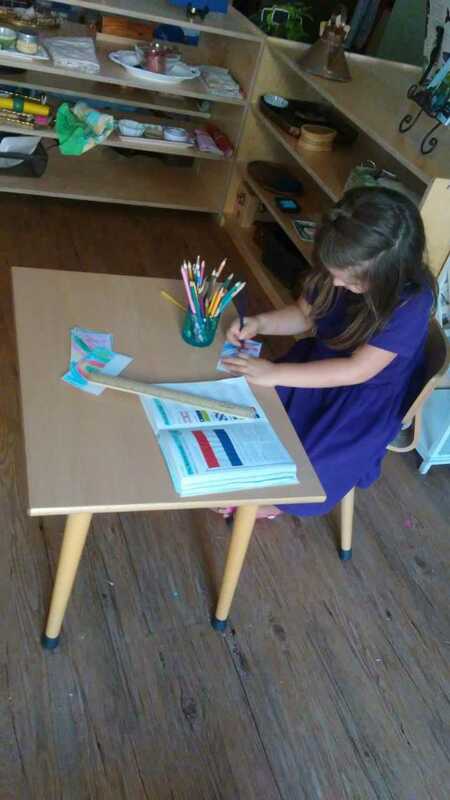 All the children have been hard at work practicing their new lessons, helping each other, and settling into a routine. We planted mint, parsley, thyme, and tomatoes in our garden. We have also added a quaint little sitting area under the tree where the children can go to reflect and enjoy the peaceful environment. Our room parents are fine tuning our Fall Social, Auction Art Project and Basket. You will soon be contacted through SchoolCues regarding donations and ways you can help out. Or feel free to contact them directly. As you know, all proceeds from the Auction go to school scholarships for children under 5 years old. It is a great opportunity to raise money for a good cause and have some fun!!!! Preparing the hand washing towels is a daily routine in our environment. The children use them to cleanse their hands before lunch. Preparing the placemats to be ironed. Association between quantity and symbol of the numbers 1 - 9 by finding objects in the environment. 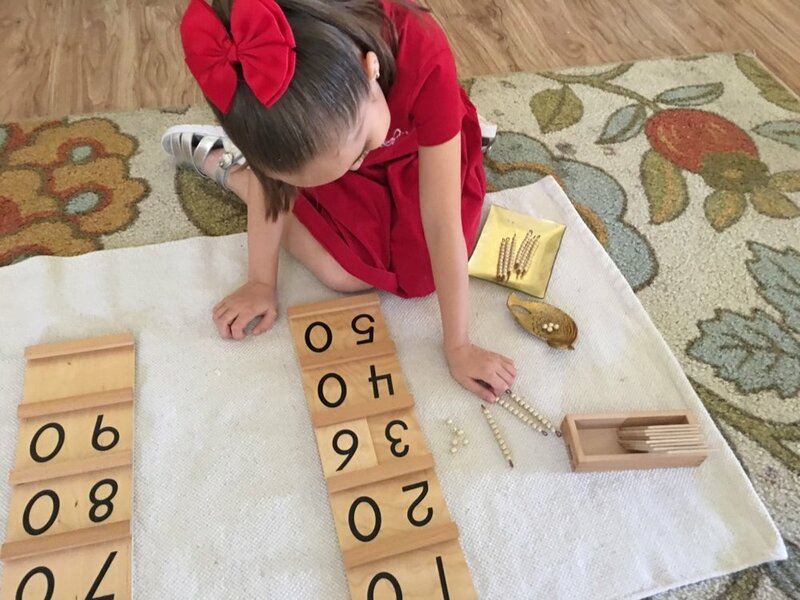 Working with the decimal system requires large and small motor skills, concentration, and independence. Preparing the hand for lightness of touch needed in handwriting. Working with the formation of numbers on the chalkboard. This work helps prepare the muscles in the hand for writing and hand-eye coordination. Addition with the stamp game. One of the processes from concrete to abstraction. Building the trinomial cube takes keen observation and concentration. Control of movement along with fine motor skills. 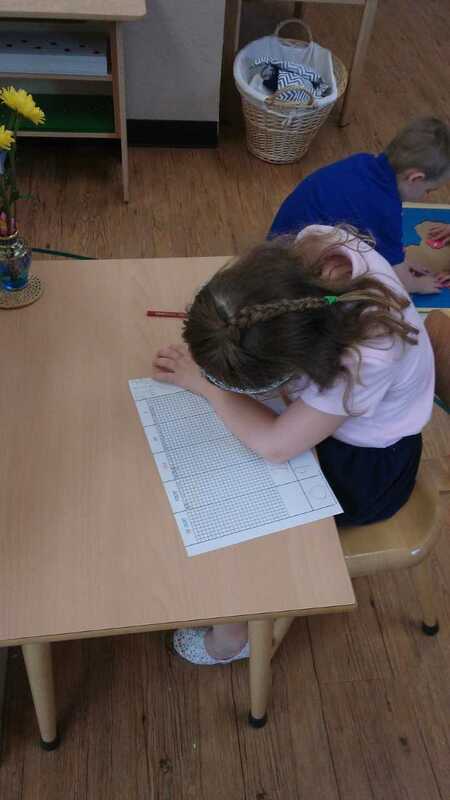 Counting in sequence from 11 to 99. Baking blueberry muffins for our sun celebration. Happy fall! It is hard to believe we are entering our eighth week of school. The children are doing very well, and have smoothly adapted to the daily routine. It's truly amazing to see what they are capable of doing. Observations and conferences will be coming soon and we look forward to have you come and enjoy a little time in the classroom. Our first social will be held on Thursday, October 5th. Please plan on attending since this is a good time to come together as a community and spend some time together. You will be receiving e-mails from our room parents with important information about this event. During this month we have welcomed two new friends into our classroom. We also welcomed a new finch bird, Lucy. Now Charlie won’t be lonely anymore. We love to hear them sing throughout the day while we work. We have planted our beautiful garden using seeds like peppers, watermelon, strawberries, cucumbers, and lettuce. The children are carefully tending to it by watering it and keeping an eye for any signs of growth. We are very excited for fall to come so that we can spend more time in our outdoor environment. Miss Marcela and Miss Dinora. Helps develop motor skills, coordination, and concentration. Taking care of the outdoor environment. Beautifying and taking care of the environment. Developing of control and coordination of movement, while strengthening organization and sequence skills. Taking care of the environment while developing the aesthetic sense. Taking care of himself and following sequence of steps. 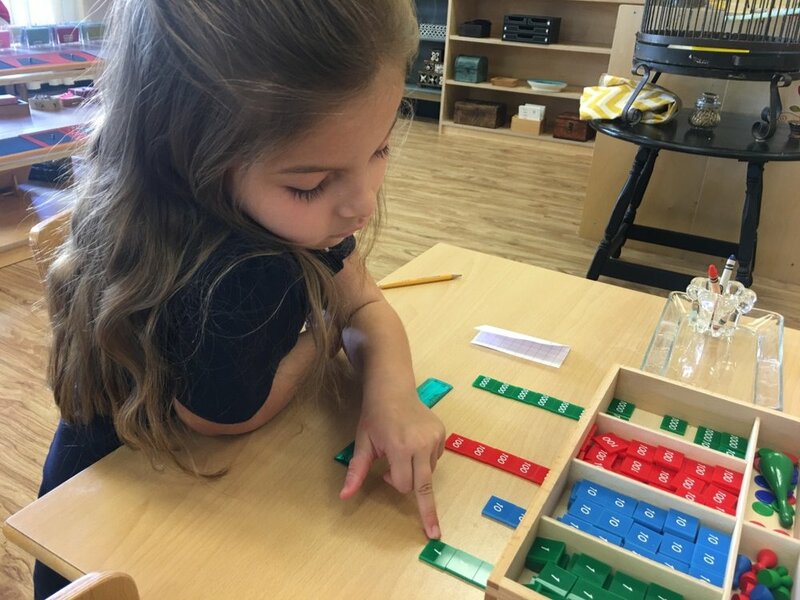 Remembering the order and sequence of steps leads to the development of concentration. Refine fine motor skills and hand strength as well as concentration. Offer the child the opportunity to get a closer look at a bug can also help to connect him to nature. Crack peanuts to use for snack can also help develop concentration and refine fine motor skills. Learning the proper use of scissors as well as developing fine motor skills. Dressing frames teach independent skills such as dressing oneself. Development of concentration and muscular action. Here we are, well into our school year and so excited for fall....especially those fall temperatures! 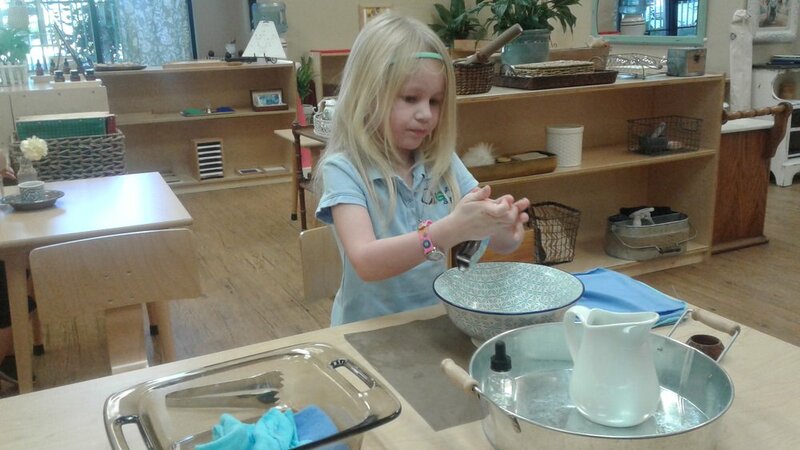 This past month we have been very busy in the Bobcat classroom making cream drop biscuits and planting our gardens. We have planted beets, squash, pumpkin, zucchini and some marigolds. We can't wait to se what our harvest will bring so we can use our bounty for yummy treats in the classroom. Our first social will be held on October 4th and we are so excited to see all of our families in a relaxed, social setting. It will be a fiesta themed social, so be sure to dress up if you like and be ready for lots of delicious Mexican food. This will be an amazing opportunity to connect with other families in the classroom, thus further building our community. See you there! Wow! We can't believe Fall is upon us. Along with the cooler weather comes fresh crisp ideas and inspiration from our natural world. The children have enjoyed the opportunity to plant and witness the wonder of growth in our gardens. We have also been discussing the life cycle of the butterfly. A fun opportunity for your child to connect what we're learning in the classroom to the outside world: Your family can visit our local Butterfly Wonderland to learn more about the miraculous journeys of these fascinating critters and become up close and personal with many species of butterflies. "I care about my cat." "I care about the Earth, our home." "I care about the trees." "I care about the animals." A big thank you to all who attended our Fall Fiesta! It was a blast! We are looking forward to classroom observations and conferences beginning in October. We would also like to extend a warm welcome to our new student, Daniel who joined our class this month. 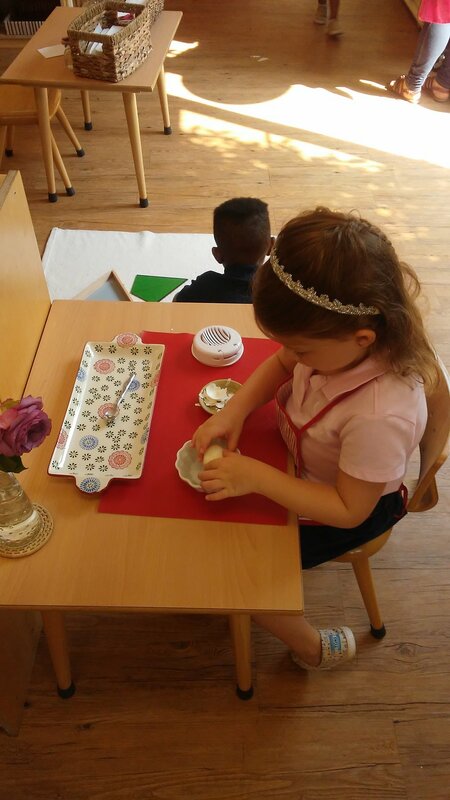 The children learn to bake completely independently through repetition, control of movement and development of sequence. After learning the continents, oceans and hemispheres through spoken language, the child chose to paint, read and label the Map of the World. 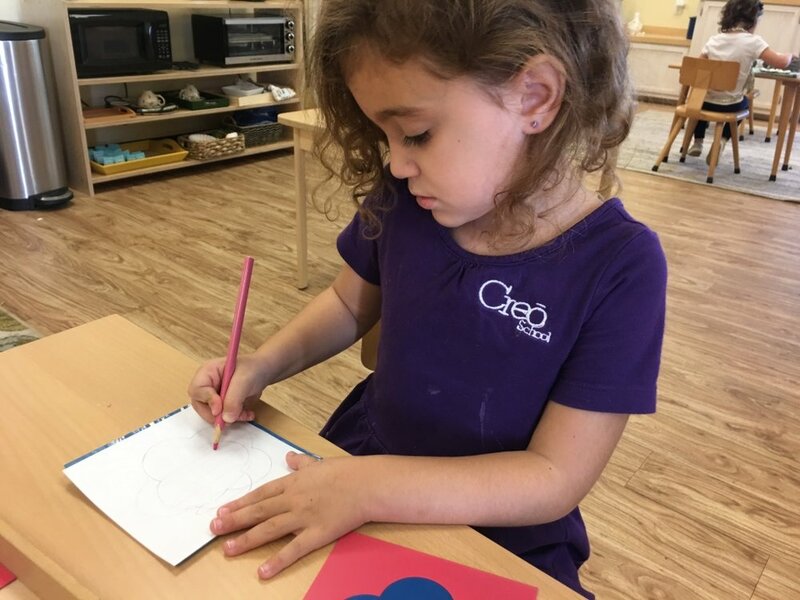 The child expresses himself in a meaningful way through writing with the moveable alphabet. Giving the impression of the verb as energy in contrast to the noun as matter and their effect on matter. The child demonstrates how to play a uekelele after telling a true story about her trip to Hawaii. Three Part Cards exploring the Parts of the Leaf.